For safety reasons, always drive with the rear head restraints in the upright position when the rear seats are occupied. For your protection, drive only with properly positioned head restraints. Adjust the head restraint so that it is as close to the head as possible and the center of the head restraint supports the back of the head at eye level. This will reduce the potential for injury to the head and neck in the event of an accident or similar situation. Do not drive the vehicle without the seat head restraints. Head restraints are intended to help reduce injuries during an accident. ► Slide head restraint adjustment button 1 up or down in the direction of the arrow. When folding back the head restraint side bolsters, do not put your hands between the side bolster and the cushion holder. There is a danger of becoming trapped. push or pull right and/or lefthand side bolster 1 into the desired position. push or pull the head restraint in the direction of arrow 2. 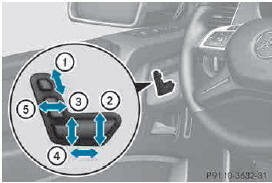 It is necessary to reset the front seat head restraints after the voltage supply has been interrupted, e.g. if the battery has been completely discharged or disconnected. ► Make sure that the cup holder on the center console is folded down . 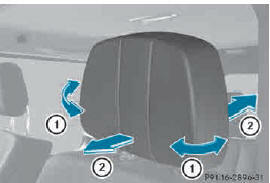 ► Move the seat as far forward as possible and the head restraint in as far as possible. Keep the area around head restraints clear of articles (e.g. clothing) to not obstruct the folding operation of the head restraints. Adjust the head restraint in such a way that it is as close to the head as possible and the center of the head restraint supports the back of the head at eye level. This will reduce the potential for injury to the head and neck in the event of an accident or similar situation. With a rear seat occupied, make sure to move the respective head restraint up from the lowest non-use position and have the occupant adjust the head restraint properly. Do not drive the vehicle without the seat head restraints installed when the rear seats are occupied. Head restraints are intended to help reduce injuries during an accident. Make sure the rear seat head restraints engage when placing them upright manually. Otherwise their protective function cannot be ensured. The back of the head will not be supported in the event of a collision. That could cause serious or even fatal injuries. Rear seat occupants can be seriously injured or killed. ► Once the head restraint is fully lowered, press release catch 1. ► To raise: pull the head restraint up to the desired position. ► To lower: press release catch 1 and push the head restraint down until it is in the desired position. ► To remove: pull the head restraint up to the stop. ► Press release catch 1 and pull the head restraint out of the guides. 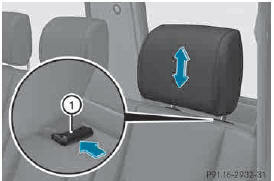 ► To re-install: place the head restraint in the guides of the backrest. The notches on the guide rod must be on the left-hand side when viewed in the direction of travel. ► Push the head restraint down until you hear it engage in position.